The Grampians region takes in a vast swathe of Victoria, from Golden Plains to the South Australian border. The area is practically covered with outcrops and cascades, and Ararat is the perfect base from which to explore the natural splendour of the region. The regional centre is the Grampians National Park, Mount Langi Ghiran, Mount Cole and Mount Buangor. 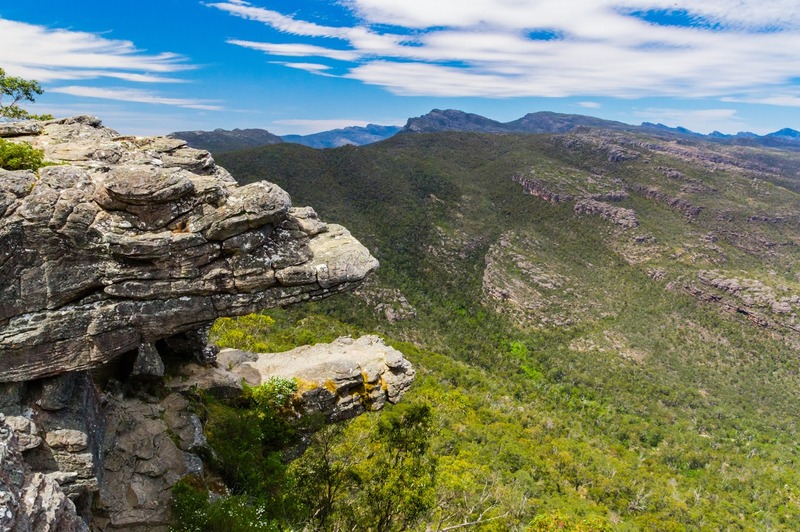 Within the Grampians National Park is the Pinnacle, or Gariwerd as it is called in the local Aboriginal language, which is perhaps the most renowned of all the Grampians’s peaks. This rocky spur provides some of the area’s most stunning panoramas, as well as a wide range of hiking tracks. There are paths that allow for nearly all levels of fitness, weaving through the rocky landscape. Make sure that you bring your good walking shoes for the paths ahead, and be prepared for the delight and wonder you’ll experience when you reach the aptly named Pinnacle. The Balconies provide another of the region’s favourite lookouts. Also known as the Jaws of Death, thanks to their passing resemblance to the mouth of a roaring T-Rex, the Balconies provide a scene markedly different to their famous Romeo and Juliet counterpart. The stonescapes are the dream of any budding geologist, while the views will have you thinking that you’re inside one of Arthur Streeton’s paintings. Mount William, standing over 1167 metres high, is the highest peak in the Grampians, and allows for an unsurpassed view of the entire mountain range. On a clear day, you feel like you can see all the way to the end of the world. Walking tracks cater to a range of fitness levels, allowing almost everyone to witness this stunning part of the world.